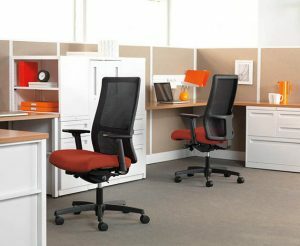 If you’re looking for desk chairs for your office or home in Alpharetta, Woodstock, Sandy Springs, or anywhere in the greater Atlanta, GA, area, look no further than the products at NorthPoint Office Furniture. At our spacious showroom located in the heart of Roswell, you’ll be able to see and sit in the huge selection of desk chairs we have to offer. Plus, we’ve created full displays of our furniture so that you can see how our chairs look in an office or home setting to help make your decision a little bit easier. New desk chairs for the office can help improve the wellbeing of yourself or your employees, and may actually increase productivity. So, when it comes to making a decision on office seating, invest in chairs with ergonomic designs and unparalleled comfort. With chairs from respected names like HON, Fairfield, La-Z-Boy Contract, and more in our inventory, you can trust that the chairs you purchase from NorthPoint will provide the quality and functionality you’re looking for. Choose from executive leather chairs, ergonomic mesh back chairs, polyester task chairs, and other styles to fit your office’s needs. When you purchase furniture from NorthPoint, not only will you receive our quality products, but you’ll also benefit from our superior customer service. We assemble all of the furniture you order from us at no additional charge, honor all manufacturer warranties, and will even repair furniture if it becomes damaged. To order desk chairs or other furniture, like workstations, computer desks, and hutches, for your business in Marietta, Dunwoody, Milton, Kennesaw, or another location in or near Atlanta, Georgia, contact NorthPoint Office Furniture or visit our showroom today.